The Su-57 is the world’s best warplane; at least, according to Vladimir Putin. Putin’s bespoke evaluation comes on the heels of a recent statement by United Aircraft Corporation (UAC) President Yuri Slyusar that the first, serially-produced Su-57 will be transferred to the Russian Aerospace Forces (VKS) by the end of 2019. It is, of course, anything but surprising that the Russian president would speak highly of the latest Russian flagship fighter. From President Trump claiming that the F-35 “wins every time” to Chinese state media alleging that the J-20 is “overwhelmingly superior” from the F-35, it would be strange for great powers to not signal confidence in their cutting-edge military projects. But as for actual military analysis, terms like “best” can obfuscate more than they reveal. Fifth-generation fighter design is a constant trade-off between between several performance criteria, including maneuverability, weapons systems, integrated radar technology, and “stealth.” The latter is especially tricky, as it refers not to a single quality but instead to a wide array of equipment and design choices to reduce a plane’s radar cross-section (RCS); simply put, to make it less detectable by radars. Assuming that the Su-57 enters serial production with its second-stage Izdeliye 30 engine, there is no denying that Russia’s fifth-generation fighter boasts an impressive “operational characteristics” spec sheet; indeed, it gives the F-35 more than a run for its money in raw performance categories like range, speed, and maneuverability. But conventional capabilities are only the beginning of the story. Insofar as stealth is considered a core “fifth-generation” feature, there is little doubt that-- everything else being equal-- the F-35 is designed to have an exponentially smaller RCS than the Su-57. More importantly, the F-35 was developed around the concept of “information fusion.” That is, F-35’s are equipped by their assortment of onboard sensors and processors to act as a kind of “quarterback,” constructing an integrated, dynamic picture of the battlefield and feeding it to nearby friendly units in real time. The F-35 can also coordinate friendly units within enemy airspace by doubling as an effective AWACS (airborne early warning and control) platform. The Su-57 can’t do these things, but what’s crucial to understand is that it isn’t trying to. And herein lies the problem with the concept of a “best” fighter,” as well as with the notion of a universally-desired checklist of “fifth-generation” features. 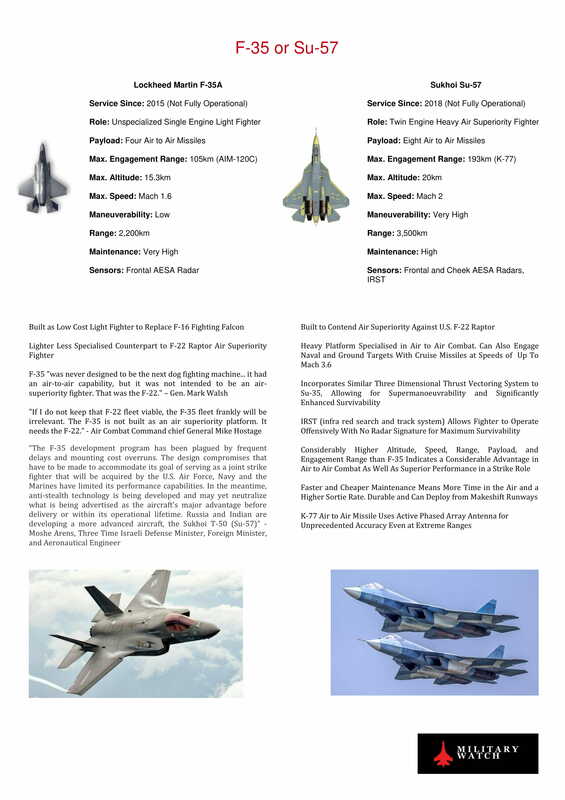 All military aircraft are designed according to their country’s unique air power doctrine and strategic priorities, leading to comparative advantages in some areas and trade-offs in others. While both fall under the unhelpfully broad label of “multirole fifth-generation fighter,” their intended operational use couldn’t be more different. Unlike its US counterpart, the Su-57 was not designed as a mobile nerve center for squadrons penetrating deep past sophisticated enemy air defense systems to neutralize critical infrastructure. Nor was the Su-57 primarily designed for the high-intensity, ground-attack roles in which the F-35 is meant to excel. The raison d'etre behind the Su-57 is an altogether different one: to create an exceptional air-superiority platform with the ability to threaten high-value air targets with raw speed, maneuverability, and anti-stealth weapon acquisition tools. Within this design philosophy, the Su-57 doesn’t need deep stealth capability and various “smart” features. To the extent Russian air combat doctrine is more interested in countering stealth aircraft than deploying their own, the Su-57 has the technical potential to the best solution for Russia’s strategic needs.